So here, free of charge, is my suggestion to lower the temperature of our political debates. Replace the metaphor for our clash of ideas, which is currently WAR, with something else. And since the Democrats and Republicans can’t yet agree on anything, I will offer up a custom metaphor for each side. The Repubs will henceforth think of, and refer to the Dems as their Red-Headed Stepchild. 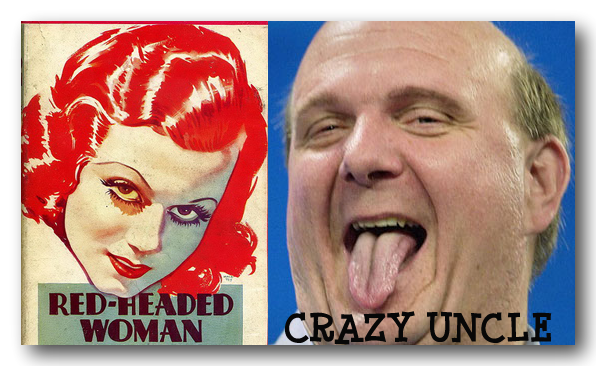 And the Dems will begin to picture their Crazy Uncles when they think of the Repubs. I think you’ll agree that these images surely elevate our current political debate. On the flip (sic) side, President Obama has already used the Crazy Uncle metaphor during the Presidential Campaign. Although he was referring to Rev. Jeremiah Wright, we know he was really thinking about the Republicans. 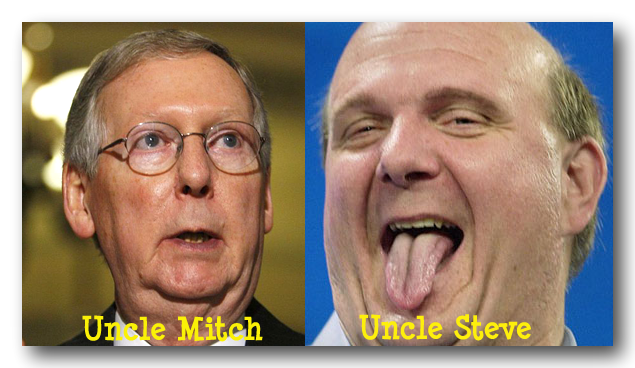 And when Mitch McConnell smiles, there is an uncanny resemblance to Steve Balmer. Although Uncle Mitch hasn’t been smiling much these days. Bob, you missed one obvious comparison: Nancy Pelosi as the Red Headed Stepchild. A quick search on Google Images brought up many a compelling similarity. I agree, and I bet the Republicans would line up to treat her like their ‘rented mule’. At the same time this would be an improvement over the War metaphor, in which they don’t want her to survive. Only a fool would want to kill his only mule!